To succeed in meeting carbon emissions reduction targets to limit projected climate change impacts, it is imperative that improved synergies be developed between mitigation and adaptation strategies. This is especially important in development policy among remote indigenous communities, where demands for development have often not been accompanied by commensurate efforts to respond to future climate change impacts. Here we explore how mitigation and adaptation pathways can be combined to transform rural indigenous communities toward sustainability. Case studies from communities in Alaska and Nepal are introduced to illustrate current and potential synergies and trade-offs and how these might be harnessed to maximize beneficial outcomes. The adaptation pathways approach and a framework for transformational adaptation are proposed to unpack these issues and develop understanding of how positive transformational change can be supported. 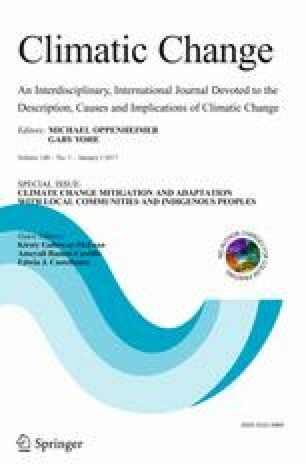 This article is part of a Special Issue on “Climate Change Mitigation and Adaptation with Local Communities and Indigenous Peoples” edited by Kirsty Galloway McLean, Ameyali Ramos Castillo, Edwin Castellanos, and Aqqaluk Lynge. We thank the indigenous communities of Humla and Alaska who contributed to this study. The research in Humla was supported by University of Oxford Fell Fund and Environmental Change Institute research grants, and the Alaska research by US National Science Foundation award # 0715431, for which we are grateful.